Hello!! Giovana here!! Super happy to be here as a Guest Designer! So today I have a super cute and almost OLC for you. 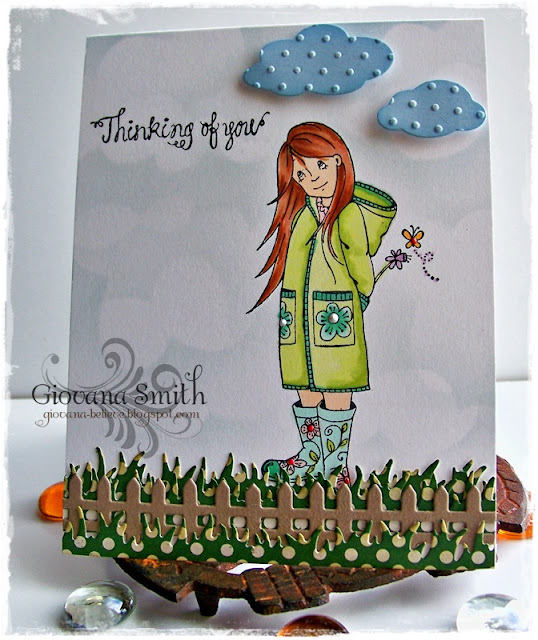 I used H240 Lizzy dressed for rain and one of the sentiments from E791 Sweet Sentiments. I think this image is super cute, living in the NW we get quite a bit of rain. The image was colored with Spectrum Noir Markers, for the background I drew and cut out some clouds, then sponged around them with a light blue ink. Die-cut some clouds, grass and fence and the card was ready!! Ink: Jet Black Archival by Ranger, Spectrum Noir Markers. Accessories: Clouds, Grass and Fence diesby Sweet 'n Sassy, Pop dots, Sponges. Oh...this is so cute... I love your layers and coloring. your background is wonderful too. Very pretty, love the coloring! Giovana this is just lovely. You brought Lizzy to life beautifully with your amazing coloring! The coloring on this is phenomenal and the use of diecuts inspired. Love the embossing on the rainclouds too.